Mercier's Cabinet and Woodworking, Inc.
We now offer Emtek door hardware! Thank you for visiting MerciersCabinets.net! We are one of the few remaining makers of custom, furniture quality cabinetry and millwork serving the Mississippi Gulf Coast area for over 20 years. 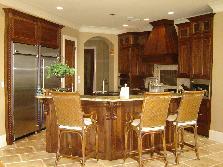 We specialize in high-end solid wood products with fine detail and specialty finishes. All our work is done completely in-house using only first quality premium raw materials.